I’ve seen a Beam Ray machine running before in another healer’s place. These Beam Ray machines are a 21st century reconstruction of the lost technology of Raymond Royal Rife with his rife machine frequency generators using vacuum tubes in the mid 20th century. 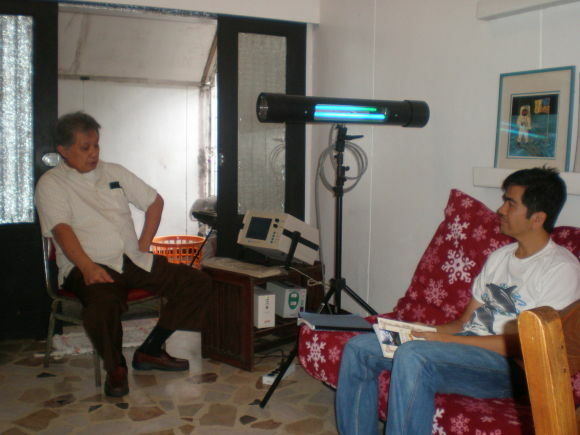 This was the first time for me to personally get treatment using a Beam Ray machine. I suspect I have pockets of infections in my lower left jaw bone where a wisdom tooth and a root canalled tooth were extracted. Last Monday morning I was unhappy to feel some pain in my lower left jaw. Did I have tooth decay? It did not feel like tooth decay. The pain seemed to be in the jaw bone. It was dull and on and off and finally off. That’s not fine with me, pain is a signal there is something wrong and I had better address it. In that lower left jaw used to be a wisdom tooth that was removed as part of a promotion when a dental surgeon removed an extra tooth growing under my tongue. Also in that lower left jaw used to be a molar I had agreed to have a root canal on by a regular dentist. When I found out how bad root canals can be, I had a biological dentist remove that root canalled tooth. And in that left lower jaw, there are odd times I would feel a spark, an electrical prick if I happen to be in a wrong position from time to time. I have a plan that may just address my suspected problem. I was going to go to the Biological dentist Dr. Gaba as my wife and my brother have good experience with him. But before going to him, I might as well address any possible infections beforehand by having a beam ray treatment with Mr. Romy Macapagal. I have a zapper, but I don’t think that will go deep enough to the bone and to the pockets where the blood vessels do not reach. So I’m thinking Beam Ray aka Rife Machine aka frequency generator was the way to go as it should be powerful enough to go straight through your body, no need to remove clothes. So last Tuesday I made arrangements by cell phone SMS with Romy and Wednesday afternoon at 2pm I was there at his place. Very simple house in Magallanes Village, Makati. Mr. Romy Macapagal is a very knowledgeable man and a joy to chat with. Good thing it was a slow day that day and I had his full attention. He has the same passion for healing as I did. His focus was using the Beam Ray, Colored Lights and he could see at a slightly shifted spectrum. With the Beam Ray, he is much in demand by several MDs who integrate his Beam Ray treatments as part of their parasite and germ fighting protocols for their patients. On the side of the germ theory, these Beam Ray machines are the ultimate tool these days. How my treatment went. Mr. Romy first put the computerized Beam Ray machine in diagnostic mode. It runs through several pre-programmed frequencies while Romy watches out for patient reactions. A reaction is something like a slight itch. If the patient reacts, he looks up the guide book and sees the corresponding frequency and the possible pathogens that need addressing. After compiling the list of possible nasty pathogens in me, Mr. Romy programs the Beam Ray machine in killing mode and off it blasts on, did me for 3 hours. I arrived at 2pm and was done around 6:30pm. Upon getting home I ate my raw beef for dinner, took a bath, and drank my avocado leaves tea before bed to help cleanse my kidneys. Mr. Romy says the dead pathogens will have to be carted off to the liver and to the kidneys for disposal in urine and in poop. This morning and this afternoon I’ve been pooping and pooping just as he predicted I would. I didn’t feel ill, but I do feel a bit tired today like he said I would. What did I think of the Beam Ray? It may be safe enough for my kids. I’m battling primary complex aka tuberculosis on my 8 year old boy. I’m thinking it may be a good idea to hit his problem both ways. My boy is getting nutrition, cleansing, and maybe he may need this germ killing machine… it’s a lot safer than the usual anti-biotic drugs they usually give for tuberculosis… I will do more research on this. Beam Ray, the frequency generator of Royal Rife, the frequency generator of Hulda Clark is here. There are nooks and crannies that cannot be reached by herbals, zappers, and drugs… these can all be reached by Beam Ray, it’s fast and cheap and could be effective in the hands of a skilled operator like Romy. Hulda Clark says many diseases have a parasite and tag along germs component. Use wisely. Hopefully, this computerized Beam Ray machine is truly selective in killing only the bad germs and not the good ones we need. I’m a pragmatist. I believe that terrain is the ultimate determinant of the health of a person, but the animal parasites are something else when they misbehave, you just need to kick them out. In my case, if I had a biological dentist clean my jaw pockets immediately, I would not have had to go through this. Maybe I did not need to have had those wisdom teeth removed after all. Please send me price information on the beam ray. My Mother in law in Manila was just diagnosed with colon cancer, where can I purchase one of these? Is there a place in the Philippines where she can be treated? Please send me information and if possible someone i can reach for the treatment. My mother has had scleroderma for 21 years. Please send me information on purchasing this beam ray machine I am now receiving treatments for stage 4 lung cancer and have no chance of survival the chemo is not working and I have 2 small children still at home and I am a single mother in need of my life. Please help me by sending me this information. I want a beam ray machine. I have a frined who allowed me to use hers. It has helped my teeth, my pain levels, my scar tissue from a major accident, my depression, and several other infirmities that I have. Where do I order and how much does it cost? I have a beam Ray also! It helped me get rid of an annoying virus. I used to get it over n over again, but I did beam Ray 6 days a week for 3 months ,1 time for 90 min n same at night .I never had it cone back. It’s been 6 years . Also my mother n law had breast cancer n she did the cancer protocal n never did chemo n she has no more cancer. How do I get in touch with Mr.Romy Macapagal? Can you give me an idea on how much a session would cost? thank you. I’d like to know if the beam ray can cure my severe cat allergy or not. is anybody can tell me. i’m sick for year already. Hello. I am interested in the beam ray machine. How much does it cost. Also, how can i get in touch with Romy Macapagal. How can i get in touch with a biological dentist. I’m from Davao city. I am interested also in the parasite cleanse. Are there practioners here in Davao city you can recommend. If none, then I would have to travel to Manila to avail of the above services I mentioned. Thank you. where can we avail of the Beam ray machine or the treatment? how can we contact Mr. Romy Macapagal? how much does the machine cost? will this also be effective for tumors though it is only benign. Need information on beam ray. where can I get one here in Manila? how much is it? can you please also send me information regarding this. thank you. Hi. How much does a session with the machine cost? How do I go about making an appointment with Mr. Macapagal? Thank you so much for your blog. where can i find romy, what is his exact location, need to treat my brother, please send me the addres and cell phone number ? how much is the per session, thank you and god bless. We wish to purchase a beam ray machine, professional model. Please supply address and details of vendors. Hope that helps anyone looking for one. I have a friend suffering from cancer. She has 2 root canals. I think it should be removed but removal should be done by a biological dentist. So is there a biological dentist in davao city? Please give much needed information.. Thank you very much. God bless..
Would you please send me more information on the machine. I would like to know all about to include helping curing cancer. We are in very much need of a machine like this. We have heard so much about it and am very interested in more information on it. Thank you. i was treated with beam ray for breast CA after lumpectomy. now im clear and back to excellent health. God is great! I would like to buy a machine like the one in the picture, please send me information on a used light or new. beam ray is less than Php500,000 per unit. office is near orthopedic hospital, atop metrobank, banaue st., QC. hope that helps! I have an almost new Beam Ray Machine just like the one in the photo for sale in Australia. I paid $7000 for it. Make me an offer. I have acquired one of these machines from a friend of mine who bought it for her mother who is battling cancer. Well her mother decided not to try this machine so she asked me to sell it for her. If anyone out there is interested please give me a call at 760-887-2221 or email me at bethwilson@mindspring.com. I would rather sell this way than on eBay. I am from San Jose, Antique. How can we avail of the beam raytechnology? May we know your office/clinic address or contact numbers? i Alan, I am wondering if you have the manual for the beam ray. I have one that somebody had in their closet however there is no manual and since they used it like 3 times they can’t be of any help. The company is of no help so I am asking around who might have one that I can get a copy of…thank you. I suffer from a long term blood disorder so any help is appreciated. I have a Beam Ray like the one in the picture for sale. Please contact me if anyone is interested. My finance was diagnosed with sarcodosis. Was wondering if beam ray would be a good alternative? I wish to purchase a beam ray machine, professional model. Please supply address and details of vendors.